Brick Town Talk: If you don't ask... - LEGO Town, Architecture, Building Tips, Inspiration Ideas, and more! You may or may not know - I asked Jamie Berard (Creator of Cafe Corner 10182) if he had any news of furture releases. This was very cheeky I know, but we NEED TO KNOW!!!!! I'm pleased to say that I received a reply this morning. Thank you Jamie. 'Actually Richard, I can tell you a little bit about a cool project I'm working on. I'm building a 48x48 Town Hall which will fit into the modular building system. The only reason I can tell you that is because it will not be a set for release. Instead, it will be the centerpiece for a huge modular building display that will be at 1000steineland later this month. Keep your eyes open for pictures. It should be quite an amazing spectacle. 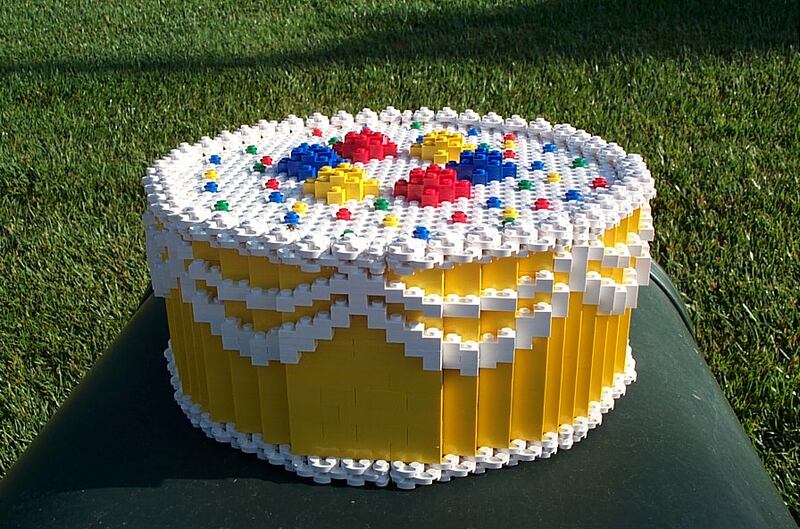 Oh, and Happy Birthday LEGO. The company turned 75 today. Cool! Thanks Richard and Jamie looking foward to see it on brickshelf! I will see it in person! About 10 of our club (MALUG) will visit TSL Berlin 2007. I haven't posted pictures of my last 3 houses, one of them is using 4 modules. So Altogether I have 16 houses ready for my layout. I will take it to TSL 2007 but it will be set up independently from the Café Corner group setup. In the remaining time I'm trying to make some more vehicles for my layout - it is a tough job for me as I don't have a lot of experience in that area. The Town Hall is finished. Woo-Hoo! Since you've done such a fantastic job with this blog, I thought it would be cool to give you first dibs on the pictures I just took this afternoon. I unfortunately will not be at the event this weekend since I'm headed back to the States for a wedding. Hopefully people will post lots of pictures so that I can check out all the fun. Rumor has it that there will be over 100 modules on display!